Last week, a presentation was held at the Indianapolis Art Center in Broad Ripple. At the meeting, the winning team displayed their first pass of the design of the garage. I was fortunate enough to get my hands on a copy of the .pdf (click here to open). I have included a couple of screen shots here to show the visually appealing aspects of the garage. Reading through the summary, I get the impression that these folks WANT to design a structure that fits into the context of the village. They do this by summarizing the different built forms currently present in the village, and how the new mixed use structure will compliment these themes. I have been critical of the garage but for different reasons than some of the local political folk who view this as another opportunity to take a stab at Mayor Ballard. I will ask that any comments offered to this thread be directed at the design itself and not the issues that contributed to the selection of the site. We are now past that hurdle in the project and won’t be going back. Until we get the financials on the project, no need to waste keystrokes on spilled milk. So, what do you think? I like how the College Ave face will address the street. And at two stories, appears that it will not be a hulking, out of scale structure like say, one of the many 5-10 story structures downtown. I also appreciate that they have made an attempt to include some sort of arts theme with the structure. Hopefully that are successful in what they set out to do, and it wont look like a big concrete block with spray paint added to it. One thing I am pleased to see is the amount of bike parking. Will this be provided free of charge? I would hope so devoid of a structured cycling fare collection system in the city; something also nice. Our Mayor has gone to great lengths to ensure that cycling is a priority in the city and in that regard I would hate to see that this structure charged to park bikes. Additionally, I see nothing about an improved bus stop on the sidewalk along College Ave where the route 17 normally travels. Wouldn’t it be nice if the garage incorporated a nice covered stop with it’s improvements to the area? Lastly, I see nothing about improving the crosswalk into the village, a question I raised the last time I blogged about this structure. One final note is that this design is still fluid. This was the first round of presentations to the public and the final product could look different. I still have a lot of mixed feelings about this in general. A few disconnected thoughts. Is it better looking than the vast vacant Marathon and brownfield? Certainly. Do I think people will still complain about lack of parking in the Village? Absolutely. It seems that there is never enough parking in the city to satisfy people who are used to acres of asphalt. Scramble Light, Scramble Light, Scramble Light. I can’t say the words enough. College and BRAve needs one for this building to work well at this intersection. Maybe after this is built, then the seemingly cursed Bakehouse/Barley Island location will finally have a use that lasts for many years. So that’s a potentially positive outcome. Other than the lack of a dedicated bus stop space in the design, I think they’re moving in a pretty good direction here. Thinking outside the box: have they talked to Chase? I see their office/teller location at Westfield and College and the drive-through immediately south of the garage site. Is there any way they could convince Chase to give up both and take ground-floor space in the newly-built garage? Maybe you could even throw them a bone and allow them to maintain a couple drive-through banking lanes off the southern edge of the garage structure. Do they have a anchor tenant for the large retail area? 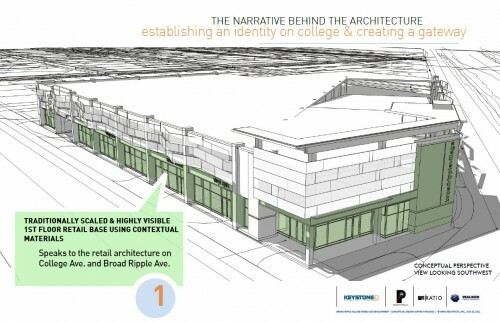 Does Broad Ripple or College Avenue really need this much more commercial/retail space? I don’t really know the answer to that Chris, so I’ll answer with another question: Does Broad Ripple need a parking garage to begin with? If the answer to that is yes (and I don’t necessarily agree that it does), then it need to service the high-profile spot in a way that is more than just a garage. Maybe it could serve as a community center instead, I guess. Broad Ripple does lack a centralized public meeting spot. But then that is a pretty big chunk of change that will not be made up with the revenue generated from commercial or retail. Kevin, I’ll have to respectfully disagree. Broad Ripple is a regional (not local) destination. As such, it will have a need to park cars of its many visitors who travel from some distance to partake of its unique atmosphere during peak/intense hours. I may not like it, but that’s the real world. On average, there appears to be plenty of surface parking in BR Village, but that’s because all the aerials are taken in daylight. BR’s intense peak times are evenings, particularly weekend evenings. Those are not times when one might reasonably be expected to bike; locals in the immediate neighborhood probably already walk. I agree with your other solution, which I posted here last year. I’ve actually come around on accepting the garage for some of its side benefits, such as enabling the neighborhood to enact a parking permit program, or perhaps encouraging more infill development. On the other hand, I really want to tackle our zoning laws which require bars to either have dedicated parking spaces or be required to apply for a variance. I agree with the idea that we need to change the zoning laws pertaining to establishments and their “parking needs” especially in Broad Ripple. Living in the area, I drive down BR Ave. or College Ave. almost daily and BR Ave. particularly looks like a ghost town between the Monon and College during weekdays. What if we eliminated the parallel parking from 3Wise Men to where the new parking structure will be, thinned the avenue down to (gasp) its middle three lanes making the street more complete, implemented a red eye shuttle to the Glendale Parking Mecca, encouraged people to use it and built a pedestrian bridge on the Monon over those two crazy intersections between the Brugge and Union Jacks? Kevin and Ryan, I sincerely hope that the forthcoming “ReZone Indy” initiative will lead to zoning overlays for districts like Broad Ripple that actually supercede underlying zoning instead of layering on top of them as the present Regional Center, Wellfield, and other special districts do. However, zoning law revision in Indiana is complicated by a body of case law and state constitutional provisions that essentially prevent downzoning (i.e. stricter requirements or additional restrictions on permitted uses) from affecting any existing (“grandfathered”) use. Not surprisingly, this is a “strong property rights” state. Once the form based codes go into affect, it will drive a lot of what happens in the village. I dont know if it will be an overlay or what, but it will be the primary means of guiding the built form so in affect, it will replace what is there unless someone makes a HUGE stink to establish a variance otherwise. I was at the BRVA meeting where these pictures were shown, but it certainly helps seeing them here for more details rather than through a projector. Does it look like they’ll be utilizing rooftop parking as well? I can’t quite tell. What kind of companies is this going to attract? I know the presenter at the BRVA said “We don’t want this to look like a Walgreens”, but it’s a concern a lot of people who live, work, and enjoy Broad Ripple have. One thing Broad Ripple does not need is another generic bar or another bank, or another chain restaurant or some crap chain like Walgreens. Kind of a sub-question: Is the rent that’ll be charged to the retail sections going to be reasonable? If they charge a lot, then I fear that the only places that’ll be able to afford to rent there will be…well, banks, chains such as Walgreens, and generic bars. I know the project is far from finished and my questions probably can’t be answered at this moment, but it’s worth thinking about. I’m fully for an IndyGo stop that has some type of covering. I know more than a few people who live in Broad Ripple and ride IndyGo, so it’d be a nice gesture to the residents of Broad Ripple. As for the bike parking, I’d like to see a combination of free and pay parking. Have you seen those boxes downtown, Curt? There’s 4 near the State House/State Government Center, 4 on Market St, and 4 on the southern end of IUPUI close to the White River. What you do with these is you pay for a membership and you call a number, get a code, punch in a code for the specific locker, and the locker opens up. Call again for another code to pull our your bike. Nice, safe, secure. Usually enough room to toss in a backpack and helmet as well. I think the cost is like $10 for a year membership. And then provide the standard bike racks as well. Maybe set them inside just so it’ll be a bit more secure. And provide those for free. Chris, that’s an excellent question. It seems like that corner of Broad Ripple and college Ave, on both the east and west corners, just don’t work well for business. The eastern corner has been home to a recent bar and restaurant (recently closed) and the Scholar’s Inn Bakehouse, while the eastern corner has been home to two different Marathon’s under separate ownership/management. Marco’s seems to be doing fine, but most people get their pizza delivered. The design is better than what I expected. I figure it will have to have rooftop parking since it’s two stories only. I think the retail will fill up eventually. Most commercial real estate people would probably agree with Chris B. and say that BR doesn’t need more retail space. However, I belong in the camp of “if you build it, they will come”. ..eventually. There will always be some turnover in BR (just recently it lost Boogie, Barley, Frankie’s, etc. ), but it is amazing how fast these spaces fill up. This is just a rumor, but I heard there were already two parties interested in the old Boogie Burger location (one of them being Flying Cupcake). That gives me hope that this too will work out just fine. Also, I don’t see how the parking garage gives us a “chance to think sustainably”. I’d like to see more dedication to a transit stop with some ability to retrofit it to any future plans for mass transit development. And I do like the placement of the police sub-station as I thought, originally, it would go right around where Marcos currently is. I also like the idea of acquiring the Chase bank and making the entire thing a little bigger, which would also allow the entrance to be further south, why not? But if this is it and this is what its going to be then fine. It is better than the existing condition and gives the Vogue something to look at other than a dilapidated gas station. This parking garage in this location is a good development. People need to admit that any higher density and/or mixed use development in this area is necessarry for the future of BRV…INCLUDING A PARKING GARAGE. What I like about this garage is that it finally gives BRV a large enough structure that acts as a gateway on the most important commercial corridor in Indianapolis–COLLEGE AVENUE. I think 3 stories would be better however. But I will defintely not miss the under-utilized gas station wasting this prime corner lot. I wouldn’t expect the design to be too much better…it’s facade is varied and interesting enough along College without being overdone and DISNEYESQUE (the versions you would typically see in Carmel or Clay Terrace). Let’s face it: it’s a parking garage. Let’s not try and pretend this is something else. 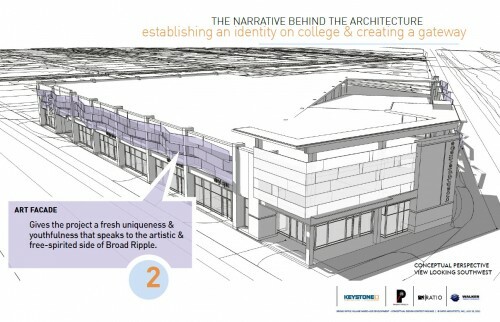 The only aspect of the design which is missing would be a unique bus shelter integrated along the College Avenue facade. Other than that? Maybe integrate a residential component around the garage for more mixed use…but not sure about the logistics, given this location. Glad to have this corner developed with a structure that divides the heart of the village with the residential homes to the west. Micah, I’m 100% with you on the idea that more density is needed, but I’d have to argue that a parking garage does not dense development make. What will? More apartments. More commercial and retail. Surely there is a market for more housing and commercial space in BRV. And integrating a nice bus stop needs to happen for sure. And I love the idea of a community center. It’s unsettling that this design for a parking garage is being considered as a “gateway” and is an impetus for “establishing an identity.” No thank you. Sure, parking in BRV is a nightmare, but I’m sorry; vibrant cities aren’t made of pretty parking facilities. Push the parking father away. Like someone else said– Glendale. IndyGo route 17 already departs from Glendale, but we all know the hours wouldn’t serve the bar goers. Until Indy has better bus service, BRVA and bar owners could partner with a private transportation company (or even cabs) to deliver a late night service to/from Glendale at a reasonable rate for their patrons. We have to creatively solve transportation problems. STOP BUILDING PARKING GARAGES. The addition of a 350 car, three story parking garage at such a prominent spot in Broad Ripple Village, at the convergence of four heavily traveled streets, markets its embrace of cars over people and is a blow (in my humble view) to our Midtown walkable, bikable, runable, family friendly neighborhoods. Public transporation is a better first step to bringing more people to the Village. However, if the plan is to continue, Ratio should clearly show how their building will contrast in size with the buildings and spaces surrounding it by presenting a drawing to scale and if sidewalk dining is an option, the sidewalks should also be drawn to what is legal scale for sidewalk restaurants. Also troubling to me were articles in the Indianapolis Business Journal, July 4-10, 2011 City not explaining subsidy. Keyston Construction CEO Ersal Ozdemir is receiving $6.35 million in public dollars to build the parking garage and he will own the finished construction and the revenue. Public dollars for private profit. Revenue from the garage should be used for further improvements desired by Broad RIpple residents. Broad Ripple’s new challenge with the parking garage is that with the additional parking spaces there will be no reason to limit additional bars and restaurants. There’s plenty of parking. A parking garage does not necessarily impact a neighborhood’s pedestrian characteristics, especially a parking garage with pedestrian-scaled activity on the ground floor (as in this proposal). Broad Ripple is already very walkable, bikeable, and runnable (I lived nearby for more than 20 years and walked, biked, and ran there) so the issue is…will this garage interfere? My answer is, not much, and it may improve things marginally. It won’t result in the removal of any sidewalks, and it will result in the elimination of several curb cuts. This is Indianapolis: we use cars to get to regional destinations like Broad Ripple (and IMA, The Children’s Museum, and Downtown). Further, a good “regional destination” in any neighborhood serves far more people than just those in the neighborhood, so people have to be able to access it relatively conveniently. So good destinations must accommodate cars, or the destination will wither and die. It really is that simple. Note that all the locations I mentioned are well-supported by parking structures. It seems this site plan barely addresses the canal directly across the street. It is too bad they haven’t taken advantage of that. My OTHER concern is that this won’t really solve any parking problems Broad Ripple may or may not have. We’re taking 350 cars that, previously, would’ve been spread out through pay lots, in the limited amounts of public (meters) or free non-metered parking, or non-residents who decide to park in the neighborhoods and walk a bit. All that’s happening is we’re taking neighborhood parking for non-residents off the table and placing them here. Which leads me to my next concern. How will traffic be handled by adding these cars to the area to an intersection that can get pretty congested even outside of lunch and rush hours? I’m not an architect and I’m not much of an artist, so I don’t know how much I can comment on the design. But this location just bothers me a lot. The Glendale area (both the mall and the various stores across the street from the mall) seems to have a huge surplus of parking that could be utilized. That should at least be explored. Bryan, I would agree that a 4-5 story mixed use residential-commercial space would act as a better gateway for this site than a 2 story parking garage with some retail. I also agree that the canal should be addressed better. What I will continue to emphasize is the best gateway for BRV on this site is a 3-5 story building: not green space or park and definitely not a gas station and one little business with parking around it (currently). 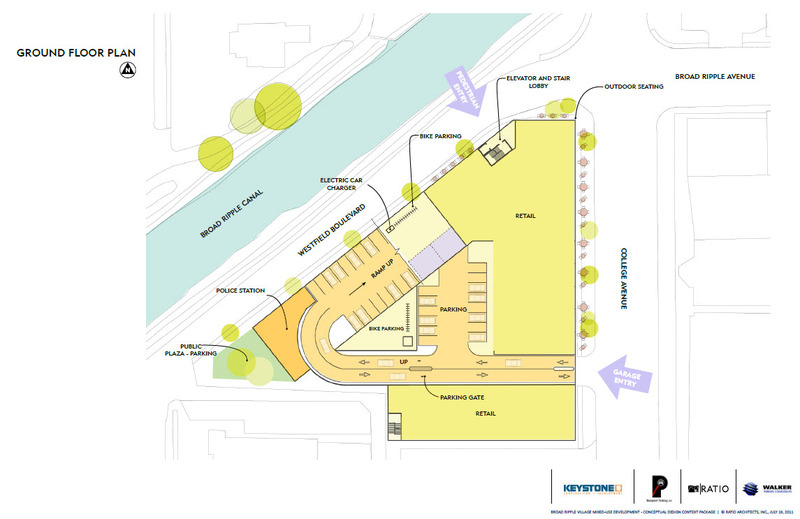 The idea of putting a parking garage out at Glendale for BRV is the most rediculous statement. First, nobody would park at Glendale to visit BRV. Secondly, if you havn’t noticed, glendale has a huge parking lot. Third, Glendale would have to be 50 times more dense with residential to justify a parking garage. I would argue that this parking garage will actually help with high density development in BRV and encourage more people to work, live and play. Why? Because there will be parking in BRV. In 5-10 years, we can all start talking more seriously about mass transit. It’s just not happening in Indy yet…let’s face it. The more I think about this…it would be nice to see 4 story residential along the canal side that wraps around the corner with commercial spaces on the first floor. The residential component would give it a more BRV feel, with the garage more hidden behind. Add an extra floor of parking for the residences. This would be the best solution for the given site in my opinion. And who wouldn’t want to live there with the view of the canal under small shops and businesses? Diggin’ this. That’s my thought, too. Think about the demand for housing in this area. I was not suggesting a parking garage at Glendale– just use of the existing lot. If parking is so bad, (which it’s not at this juncture), and BRV is truly a unique regional destination (which I believe it is), I think people would be happy to pay, say, $6 for easy parking and a shuttle ride. My argument was a little different. Apply the city subsidy to the park ‘n’ ride costs (parking lot lease and shuttle lease/operating costs) and let people ride free or cheap ($1 each way) which provides a reasonable trade off. Pay for parking in the village ($5 or more) or pay for cheap parking and a ride from Glendale. Ultimately, this might even spur development of some bars or restaurants in Glendale, which is better suited to handle regional destination traffic and parking. It would address the concerns Ann Stack expressed, of needing a way to control the conversion of additional BR commercial to nightlife. Love the idea of adding some nightlife and entertainment directly to Glendale. Chris’ idea makes a lot of sense, and if it would work, it would be a cheaper way of solving at least two problems. However, I am just not convinced that park ‘n’ ride would have popular appeal (even if subsidized). Are there any comparable examples of this in other cities? But as Curt said, there is no point worrying over spilled milk. It seems like this garage will be going up. Just wanted to add one more thing, I agree with people commenting about not taking advantage of the canal…we need a promenade, canal/promenade should be a focal point of the village. In other cities, it’s called public transportation. Good luck pursuing a city subsidy. COIT dollars could fund transit, but it hasn’t happened here. Legislation has been on the books for years that would allow COIT money to fund transit. The library successfully petitioned the General Assembly for access to this discretionary fund. Clearly the trend of privatization is a city favorite. That’s why I mentioned a private partnership. A promenade would do the village justice. I haven’t heard anything about what this contest was, who put it on, etc, so I’m not 100% convinced it WILL happen. Like lots of plans, could just be a pretty drawing. – City funds available for this project could not be used for transit as per state law. • The Village would like to see at least 2 IndyGo transit stops enhanced and the conversation is underway – who pays? • There is a serious drainage problem at the intersection and we’d like to see it addressed – once again, who pays? • Other than Marco’s & IMPD substation, it’s too soon to tell what tenants will lease the space. The Village will continue to advocate locally-owned enterprises. • The Development team is working with Indpls Arts Center and Indy Arts Council to incorporate a major piece of public artwork into the building. • Canal enhancements on the west side of College would have to be of an entirely different nature from ones currently proposed from College east to Westfield. With the Citizens Energy deal about to close, the opportunity exists to have the discussion with the new owner – but that’s down the road a ways. 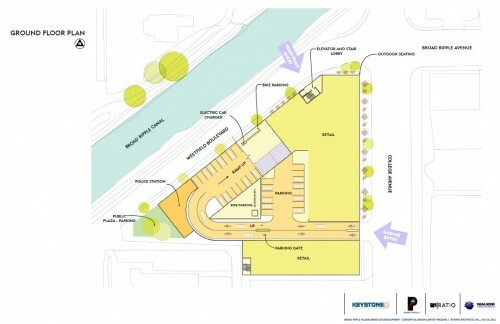 • The Village first identified the need for a mixed use parking garage in 1994 and the 2007 Walker study agreed that it should be part of a 3 part solution: 1) 300 space garage, 2) neighborhood parking permit program, 3) shuttle. Will this one structure “solve” all of BRV’s parking woes? Hardly We’re working on carving more free public parking out of existing ROW. The Garage is a good first step. If the “shuttle” were solely what I suggested (a “parking lot shuttle” integrated into the operation of an off-site parking lot), then it’s NOT “mass transit”. I think it’s not too far a stretch to use the “parking meter” money for it. That’s what lawyers get paid to figure out. Parking meter $ is required to go to infrastructure & shuttle doesn’t qualify. Garage w/ public parking does. The only issue with this is deciding how to fund operating costs. Otherwise, I think your points have some validity. Tom – thanks for your insightful comments. I hope the Canal enhancements discussion (east and west of College) continues. Has there been any fundraising for “Canal promenade”? I thought I read something along those lines, but could not find any specific info. JP: community aspirations for Canal improvements date back to 1987! Most recent plans would make an excellent future post to UI – if there’s any interest. Curt: Of the 7 proposals, 2 were DOA. Of the remaining 5, 3 featured existing IndyGo stops. None offered enhancing those as part of the project. The Village would have lobbied for improvements but who pays? Westfield & Winthrop has been discussed as a possible scramble light corner but a traffic light would have to be installed. Who pays? Shell station site proposed a “transit hub” for a system that might be 10-15 years in the future. Cardinal Fitness/Kroger site already has pedestrian crosswalks but did not capture cars before they arrive in the congested center. Shell site did not include Canal improvements like lighting and an additional ped bridge and asked for 10 yr tax abatement and replaced affordable housing stock w/ “market rate” housing. The scramble light location is an interesting thought. Someone over on IndyCog once made mention of a diagonal crosswalk for the Monon there which would eliminate some confusion that currently exists by people trying to cross two streets to continue on the trail. That may be cheaper in the long run vs a light of some sort. I think it would be interesting to see the proposed “transit hub” concept. FYI, and straight from the source, a typical covered shelter costs about $5k to plan, construct and install. Does anyplace besides the strip mall have that long of a continuous facade? Seems like they should change it up a bit as you keep traveling past it. I do hafta say that an appartment/ condo mix would be perfect for this site. The existing parking lot behind vogue theatre (on Carrolton) is not a great location for anything but parking so its a shame they aren’t putting it there. Travis, there were 5 sites considered and the Marathon station was considered the most accessible. The spot behind the Vogue lacks egress routes in that it would most certainly be fed by the one-way off Carrollton (already a congested ) turn (and I can’t tell you how many times I see people heading north there); a narrow one-way alley to BRAve and a very narrow 62nd Street route with poor visibility/access on College. Putting a 2 or 3 story parking garage in there is just unworkable with the present ingress/egress. I didn’t know that. Thanks. It’s just too bad they are having to give up some prime property for a use that doesn’t best fit there. Thats why the building should be mixed use, with a 4 story commercial-residential component facing Westfield (or the Canal). The site is prime, accessible and large enough to support such a project. A 2 story parking garge will set BRV back a bit…a joke for such a prime spot. 3 stories of parking hidden behind 4 stories of residential-commercial, PLEASE. It’s just what’s right for the location! I am thrilled with this new structure. Many people worked long hours on this project and the Mayor stepped up and got it done. 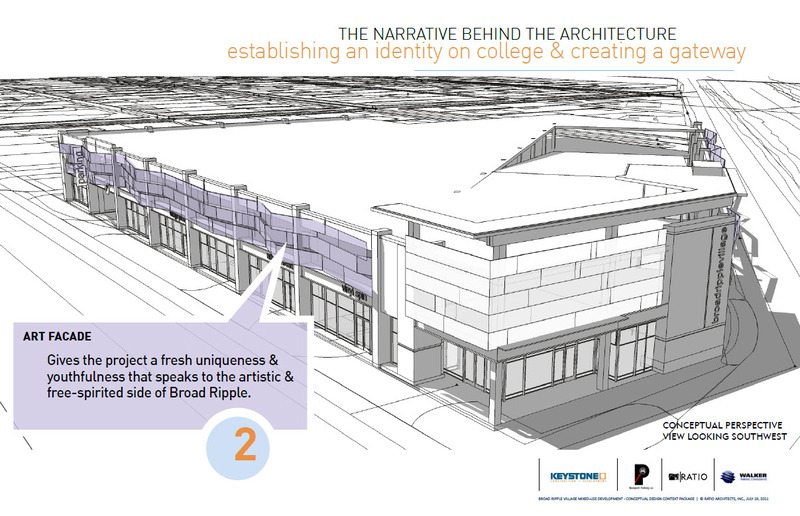 Finally, the blighted looking corner at College and Broad Ripple Avenue will be reborn.